You can use felt for crafts. For experienced artisans and beginning crafters alike, wool felting is a fun and easy way to open up new creative possibilities. There are several methods for felting wool fibers, and each one is suited to a different kind of project. You probably know that wool is a natural fiber than comes from sheep, but did you know that wool fibers actually have little scales? Felt is created when these scales interlock and create a mat. You can use several methods to raise the scales and cause them to lock together. Many felting methods involve heat, soaps, or friction. 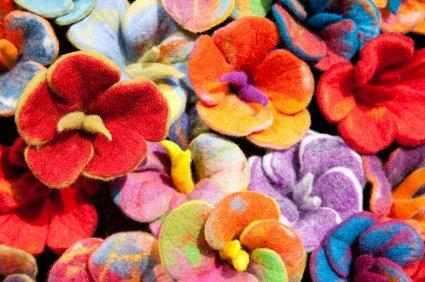 Legend says that wool felting may have originated in Sumer, which is part of modern Iraq. As they were fleeing from persecutors, ancient Sumerian men put soft bits of wool in their sandals to help prevent blisters. When they reached their destination, the heat and friction of walking and moisture from the men's feet had felted the wool, producing crude socks. For centuries, people around the world have used wool felt for clothing, footwear, dwellings, rugs, and a variety of other textile needs. Today, this versatile fabric is used in everything from automobiles to musical instruments. It also makes a great craft material. To create a felted project, you usually need to start with carded wool or roving. This is wool fiber that hasn't been spun into yarn. It comes in an infinite variety of colors and is soft and fuzzy. You can buy roving at most craft stores or yarn shops, as well as specialty Internet stores. No matter where you get your roving, make sure it is 100% wool. There are several felting techniques for crafters, and you may want to experiment with each one. Select a piece of roving. Dip it into the bowl of soapy water. Wearing the gloves, work the roving with your hands. Rubbing the wool will help the fibers interlock. Take the wet roving out of the water, and use the towel to press all the moisture out of it. Adjust the shape of the felted roving to create your project. Use the hair dryer to completely dry the roving, which will shrink a bit with the added heat. Continue to adjust the roving until it has the desired size and shape. Pull off a piece of roving, and loosely form it into the desired shape. You can do this freehand or use a cookie cutter or felting form to guide you. Place the roving on the felting mat or a piece of foam. Use the felting needle to stab the piece of roving. Each time you push the needle in, be sure to pull it out completely so the barbs can catch the fibers. Insert the needle at different angles as you work. Remove the felted roving from the mat, and flip it over. It will be fuzzy on the reverse side. Use the needle to stab this side, tucking the loose fibers into the piece as you go. The piece is finished when it has the desired shape and texture. Place the knitted item in the pillowcase, and knot the end. Wool felting releases fuzz that can clog the filters in your washing machine, so a pillowcase will help contain the mess. Add a small amount of detergent to the machine, and set the water temperature to its hottest setting. Begin the wash cycle. Check the piece every few minutes to see if it has the desired size and texture. Once the piece is the right size, remove it from the pillowcase and rinse it thoroughly in warm water. Use a towel to blot the moisture from the felted piece. Shape the project as desired, and lay it on a flat surface to dry. If you are felting a knitted piece for crafting, you can toss it in the dryer so it can become even denser.